This has been my go-to Sunday night comfort meal the last few week. On Sundays, you don't want to make too much effort, but you might want to eat something healthy after the possibly naughty food you had throughout the weekend. It's also likely that your fridge is looking pretty empty but you still have some random leftover veggies. So then it's the perfect time to make this spicy vegetable curry. It only requires a bit of chopping, stirring and one pan (barely any washing up) Healthy comfort food at its best! For this curry you can use any vegetables you have at home. Just make sure you have some 'hard' vegetables in there such as carrot, (sweet)potato or pumpkin. You can also use veggies from your freezer like snow peas. You'll probably have most of the ingredients at home already (you can skip some of the ingredients if you don't have them). I replaced coconut oil, which I usually use in curry, with rice cream since my brother doesn't like the taste of coconut, and it worked perfectly fine! Start by chopping all your vegetables into bite-size pieces. Also chop the onion, ginger, garlic and chilli. Take a large deep pan or pot, put it on medium heat and heat up a dash of vegetable oil in it. Then add the onion, garlic, chilli, ginger and spices and fry it until the onion has softened a bit. Make sure you stir constantly so it doesn't burn. Now add all the vegetables and stir well, until everything is coated with the spices. At this point you can add more curry powder and smoked paprika if you like! Be generous with the spices, it will give the dish a lot of flavour. Now add the lemongrass (cut into 4 pieces in the length), 2 stock cubes, and boiling water (until about half the vegetables are 'covered'). Place a lid on the pan, reduce the heat and let it all simmer for 20 minutes or until the vegetables are al dente. Keep an eye on it and make the sides in the meantime (I'll get to that). When the vegetables are more or less cooked, take off the lid, add a pack of rice cream (or soy cream/coconut milk) and the can of tomatoes. Stir well and let it boil for 10 more minutes on high heat so it can reduce. Now your curry should be ready! Now you could easily eat the curry like that, on its own, but I like to have something extra on the side. I've eaten this with basmati rice, sticky jasmin rice and with quinoa courgetti/zuchetti. It could also be pretty nice with some naan bread! 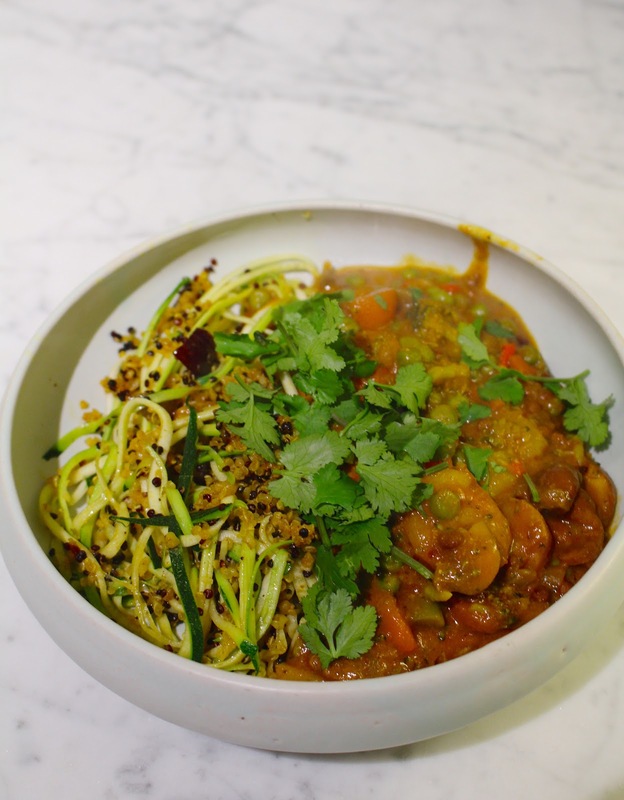 Rice is the quickest and easiest option, but if you have a bit more time, then turmeric spiced quinoa with zuchetti is the way to go! How to make the quinoa + zuchetti? I used both white and red quinoa and cooked it according to the instructions. Then I fried some red onion in a pan and added the quinoa. I added salt, pepper and a lot of turmeric (kurkuma) because it gives it a nice yellow colour and it's super good for you! To make the zucchetti I peeled one zucchini julienne-style and then added it to the quinoa. Combine it well and serve right away, so the zucchini keeps a bit of its crunch. I like to serve the curry in shallow bowls. 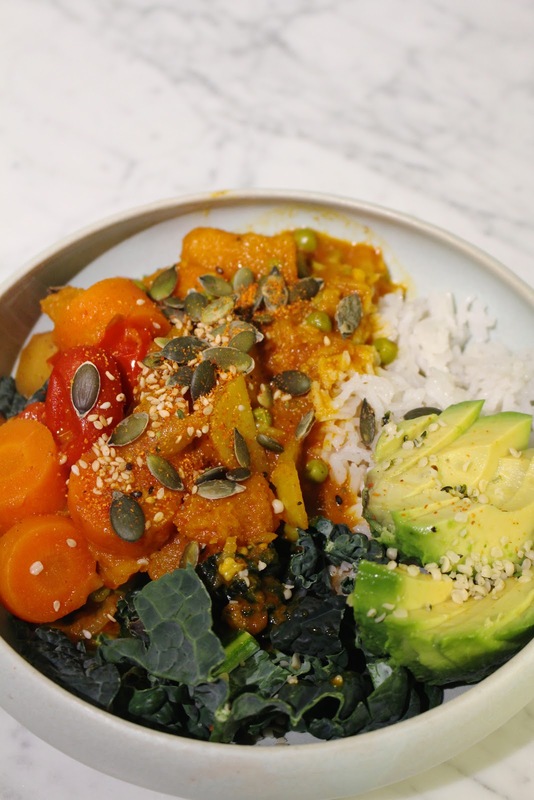 Add a few spoonfuls of vegetable curry, then rice/quinoa, maybe some baby spinach or kale on the side, half an avocado and then fresh coriander and pumpkin seeds on top! I always make a big pan of curry so I can enjoy it as a leftover the next day as well! Although the recipe might seem elaborate, it's really all about putting together any ingredients you think might work, chop and cook! It's a pretty easy vegan meal and perfect for cold winter weather. I made this for my meat-loving brother once and he said it was delicious, filling and that he didn't miss the meat. So it's definitely man-proof as well ;) Enjoy!